Inequality has drastically increased in many countries around the globe over the past three decades. The widening gap between the very rich and everyone else is often portrayed as an unexpected outcome or as the tradeoff we must accept to achieve economic growth. 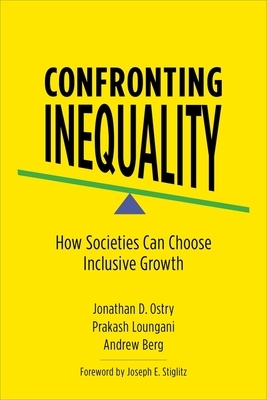 In this book, three International Monetary Fund economists show that this increase in inequality has in fact been a political choice--and explain what policies we should choose instead to achieve a more inclusive economy. Jonathan D. Ostry, Prakash Loungani, and Andrew Berg demonstrate that the extent of inequality depends on the policies governments choose--such as whether to let capital move unhindered across national boundaries, how much austerity to impose, and how much to deregulate markets. While these policies do often confer growth benefits, they have also been responsible for much of the increase in inequality. The book also shows that inequality leads to weaker economic performance and proposes alternative policies capable of delivering more inclusive growth. In addition to improving access to health care and quality education, they call for redistribution from the rich to the poor and present evidence showing that redistribution does not hurt growth. Accessible to scholars across disciplines as well as to students and policy makers, Confronting Inequality is a rigorous and empirically rich book that is crucial for a time when many fear a new Gilded Age. Jonathan D. Ostry is deputy director of the research department at the International Monetary Fund, where his work on financial globalization and inequality has been influential in bringing about a shift in the IMF's stance on these issues. His many books include Taming the Tide of Capital Flows (2017). His work on inequality and unsustainable growth has been cited by, among others, Barack Obama. Prakash Loungani is assistant director in the IMF's Independent Evaluation Office. Known for his work on the difficulty of forecasting recessions, he blogs as The Unassuming Economist. Andrew Berg is deputy director of the IMF's Institute for Capacity Development. He previously served at the U.S. Treasury, including as deputy assistant secretary for East Asia and Latin America in 2000-2001 and chief economist of the Mexican Task Force in 1995-1996.